Batley Bulldogs will be hoping to spring a surprise in the Ladbrokes Challenge Cup on Sunday when Leigh Centurions visit Fox’s Biscuits Stadium in the pick of the fourth round ties. Leigh have lost five of their opening six league matches, with their only win coming at home to Batley, and Matt Diskin’s side will be bidding to spring a surprise against the pre-season Championship favourites. Diskin said: “Leigh are not in the best of form but they are a fantastic club and we want to have a crack at them. “We will go with our strongest side and that means players being right physically and also on form. Batley will hope to capitalise on Leigh’s suspect defence as the Centurions have conceded 132 points in suffering defeats to Barrow, Toulouse, Featherstone and Halifax in their last four matches and there is added incentive for the winners, knowing Super League clubs join for the fifth round draw. 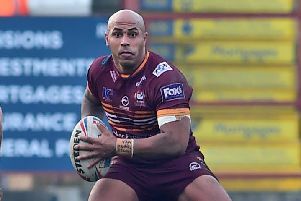 Influential back rower Dane Manning missed last week’s defeat to London following an incident in a Batley nightclub which resulted in the 28-year-old receiving a wound to his back in an alleged stabbing incident. Batley have received some good news as prop forward Adam Gledhill’s injury is not as bad as first feared. Gledhill was thought to have ruptured his ACL, which would have ruled him out for the season, but tests have come back confirming the injury is a sprain, which will keep him out for between eight to 12 weeks and he should be back for the back end of the season. Full-back Dave Scott has also committed his future to the club by signing a contract extension until the end of 2019. The Scottish international has played 68 games and scored 26 tries since joining from Doncaster in 2016 and he has played in each of Batley’s four Championship games this season. Bulldogs scrum-half Dominic Brambani was sent off in last week’s defeat when he disputed a referee’s decision. Batley were waiting to receive audio tapes from the RFL before making a decision on whether to appeal Brambani’s red card.